The Plains Bison, also known as the American Buffalo, (like its close relative, the Wood Bison) belongs to artiodactyla – or, the even-toed ungulates – the order that includes cattle, sheep, goats and pigs. According to the Colorado Foundation for Agriculture, it evolved directly from the 30 percent larger Bison antiquus, around the end of the last Ice Age, roughly 10,000 years ago. Bison antiquus evolved, in turn, from the still larger Bison latifrons about 22,000 years ago. Bison latifrons had a horn span of seven feet. 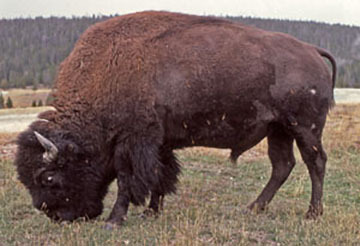 The Mammals of Texas describes the modern bison as "a large, cowlike mammal with [a] distinct hump in the shoulder region; head, neck, shoulders, and forelegs with long shaggy hair; hind part of body with short hair; head heavy with short, curved, black horns; tail short and ending in tuft of hair; color brownish black anteriorly, brownish posteriorly." The ears may be almost obscured by the long crown of hair on the head. Size and Weight: Among the largest land animals in North America, the Plains Bison bull may measure some 6 1/2 feet at the shoulder and 11 or 12 feet from the head to the rump. It may weigh as much as a ton. Typically, the Plains Bison cow is about 10 to 15 percent smaller than the bull. The Head and Hump: The low-set head and large hump may be anatomical adaptations to facilitate grazing the short-grass prairie lands of the Great Plains, suggests Russell Dale Guthrie in his book Frozen Fauna of the Mammoth Steppe: The Story of Blue Babe. A bull's head, with a massive, thickly padded skull and permanent upward curving horns supported by a heavily muscled neck, serves as a battering ram in fights between bulls. Tail: According to Annette Lamb and Larry Johnson, American Bison, the Plains Bison's two-foot-long, tufted tail has been called a "weather-vane" that signals the animal's temperament: A loose, hanging tail indicates relaxation; a partially raised tail, alertness; a horizontal tail, excitement; a raised tail, combativeness. Coat: The bison's thick winter coat – with coarse guard hairs and a downy undercoat – provides insulation so effective that snow accumulates on the animal's back without melting from the heat of the skin. The animal sheds its thick winter coat in the spring, wallowing in saucer-shaped dirt depressions, or "buffalo wallows," to loosen the hair and combat biting insects. Senses: Eyesight poor, but senses of hearing and smell acute. 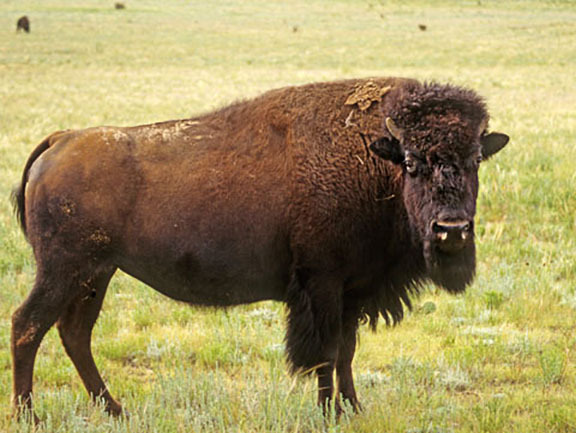 Prehistorically, said Jim Pisarowicz, writing for South Dakota's Wind Cave National Park, the bison ranged "from the Great Slave Lake in northern Canada, south into Mexico and from coast to coast." According to some estimates, it numbered as many as 50 million to 60 million when Columbus arrived. The bison – also called the American Buffalo – may have been the most abundant large mammal on the planet. In the Great Plains, the bison favored the open prairielands and river valleys, where it grazed primarily on the grasses and sedges (although it may have occasionally browsed on berries or lichen). The grasses grew in stands called "short grass," "tall grass" and "mixed grass" prairies that spanned vast ranges. The sedges, which resemble grasses, usually grew in thick clusters in shallow water or moist soils. 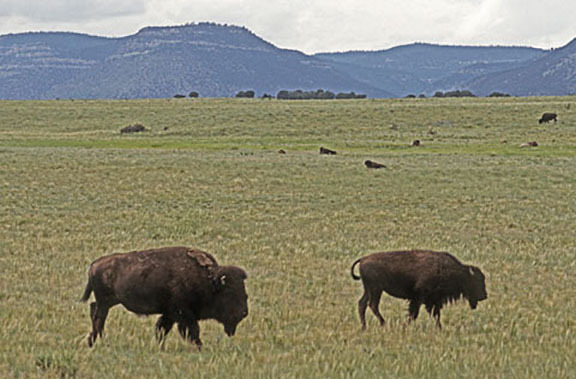 Plains Bison herds moved continuously to avoid overgrazing and to reach seasonally favorable terrain. Moving herds created trails that became early passageways for humans crossing the prairies. Plains Bison favor open prairielands and river valleys. The Plains Bison feeds primarily in the early morning and late afternoon, often ranging over several miles. Typically, especially in the warmer seasons, it spends its days recumbent, chewing on its cud and wallowing in dirt. It normally rests through the night. Dangerous and unpredictable, the Plains Bison can turn, with surprising nimbleness, on a foe. It can run 30 miles per hour in eluding or counterattacking most would-be predators. "A bull with lowered head, snorting and pawing the ground, with tail stiffly upraised," said Pisarowicz, "conveys a universal warning of danger that is impossible to ignore!" With the onset of spring, the Plains Bison feels the call of the mating season. Small bands coalesce into larger herds. The bulls fight for mating rights, sometimes in ferocious head-to-head clashes. Although generally promiscuous, a single bull might choose a cow, "tending" her if she is interested. He will drive away other bulls until she becomes ready to mate. Generally, the Plains Bison mates from early to late summer. The cow delivers a single reddish brown 30- to 70-pound calf (twins are rare) the following spring, about nine months later, in a secluded location. She relies on the nutrient-rich new growth of the season to produce ample milk for her offspring. Typically, after a couple of days, she and her new calf, which finds its legs only a few hours after delivery, join a group of cows with new calves. She nurses her calf for perhaps seven months, when she will normally wean it. The calf grows quickly. It begins to graze within days of its birth. Its reddish brown coat begins to turn chocolate brown within a few months. Its hump begins to develop. By the time the calf reaches one year old, it may weigh as much as 400 pounds. A young bull will reach sexual maturity within about six years, a young cow, within two to three years. Some sources suggest that a Plains Bison may live in the wild for several decades, but other sources, for only 12 to 15 years. During the first four centuries of European settlement in North America, the Plains Bison became the victim of perhaps the greatest wildlife slaughter in history. By the middle of the 19th century, the animal had been completely exterminated east of the Mississippi River. By the late 19th century, all but a few hundred had been exterminated west of the river. The bison died primarily at the hands of hunters, who shot them, especially during the mid-19th century, in a campaign to deplete the Plains Indians' larders, a commercial enterprise to market the meat and tongues and hides, or simply as a senseless slaughter to demonstrate marksmanship. The bones of bison lay on the plains until the Great Depression, when impoverished scavengers gathered them in wagons and trucks to sell to soap manufacturers. Although the Plains Bison rebounded somewhat in the 20th century thanks to conservationist efforts, many have been crossed with cattle, diluting the species. "The few remaining genetically pure wild bison must be conserved separate from cross-bred to protect pure bison genes," according to the Defenders of Wildlife. In the winter, the Plains Bison use their massive heads to root snow aside so they can reach the grass below. During the breeding seasons, the bulls bellow, producing a sound that can be heard from several miles away. When railways were built across the plains in the second half of the 19th century, many bison fell to the rifles of people who shot them from passing trains, leaving the carcasses where they fell. In 1891, several bison were moved to the Smithsonian National Zoological Park, becoming some of the facility's first residents. In a few examples of the Plains Bison's importance to the Plains Indians, its flesh served as meat; its hide for shelter, clothing, blankets, shields, bags, cordage, boats and drums; its bones for tools and weaponry; its horns for dishes and containers; its sinew for bowstrings and threads; its dung for campfire fuel; its skull for ceremonies and rituals.